A shout out to @Hai-Lee for encouraging me to do this build when I mentioned I’d destroyed a lot of wings trying to fly one without success. I have an F Power Pack I’ve been struggling to find a plane for and it’s perfect for this job. This is one of the simplest builds I’ve ever seen and very elegant at the same time. Said to be near indestructible if built well. Seems like a perfect wing for me to learn on. I'm going to learn to fly a wing if it kills me as it has all of my wings thus far. @Hai-Lee has a build thread in our forums I’ll be following. Everything is explained clearly so I feel confident it will go well. I’m a big believer in the KISS principle. This plane is all that. I started with printing a tiled version of the plans. To fit a sheet of foam board, I reduced the size to 92% of original which was 31.5 inches. My plane will be 29 inches. Took 3 sheets with some good sized leftovers to build parts for other planes. I’m using white glue to assemble the layers and glueing all 3 layers at once. I don’t want to be rushed getting things right. Nice to have some wiggle room to align complex shapes and be able to coat the entire surface with a thin layer of glue. I found the paper on the foam sucked up glue and I had to spread the glue around to make sure there was some remaining on the entire surface. I didn't spare the glue. It's cheap and easy to clean up. Parts cut out and ready for glueing. Parts glued and ready for weight. Scrap strips added behind top layer to distribute weight over the middle layer allowing me to glue it all in one step. Used scotch tape to keep things from moving around. "Wife's out of town." 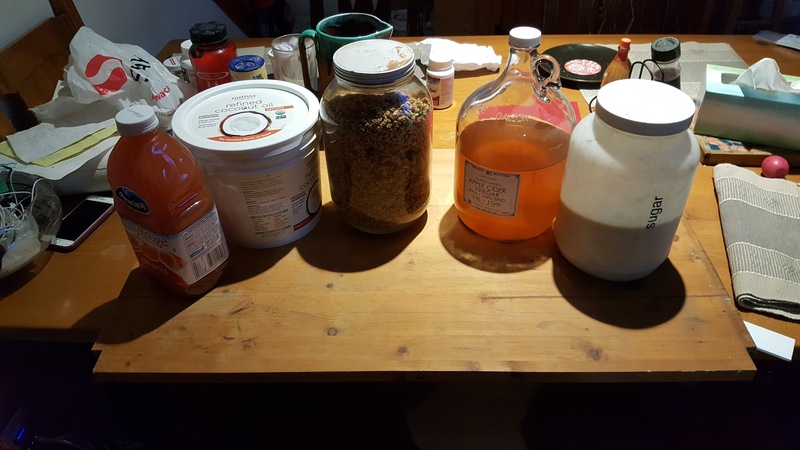 Had to empty a shelf in the pantry before I removed it to use as a press. Figured I'd use some of the items I removed to weigh things down. Gotta remember to put the pantry back together before she gets home. Waiting for glue to dry. It'll be back on the bench tomorrow night. Time to cook a frozen pizza. Lol 😂! That looks good, maiden is rapidly approaching. Good luck and have fun! Parts glued and ready for weight. Scrap strips added behind top layer to distribute weight over the middle layer allowing me to glue it all in one step. A pantry shelf Now that lateral thinking! Really waiting to see this one fly! Surprise! Left the weight on the wing for 48 hours because I was busy with other things. Came out flat as a pancake. Put it on the bench last night and didn't look at it again until just now. The distortion is incredibly consistent. 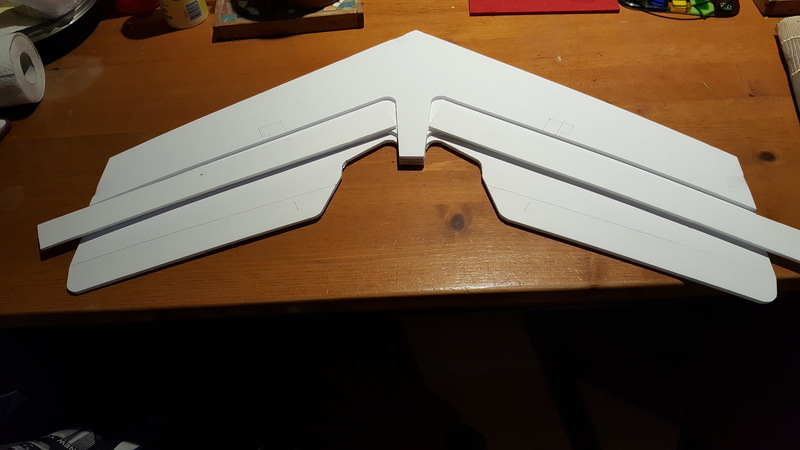 When I weighted the nose and measured, outer wing fronts are 7-8 mm, backs are both 23 mm. My first thought was damn and then I started wondering. Will it fly? My best guess is white glue interacting with paper and perhaps the glue used to hold on the paper. But I'm not sure. The material has pulled into a gentle upward curve, identical in all directions. The surfaces are solidly glued. Not sure at what point this process will be done and if I've reached maximum curvature. Looks really cool though. I'm tempted to keep building but don't know enough to know if I'm wasting my time. Wondering about another try with different adhesive or removing paper on all surfaces to be glued. A weird problem I never anticipated. The wing has "Cupped". That means that the glue shrank as it dried and you used PLENTY of glue. It will fly but you may be able to reduce the curve if you apply plenty of glue evenly to the underneath side and then weight down the centre line whilst it is upside down as it dries. If the curve is equal from side ot side it will fly a little more stable than the original due to its in built dihedral. Lets use know if you are going to continue, attempt to flatten the wing, or rebuild. I wondered about the dihedral effect side to side. What about the curve front to back? My first thought was built in reflex. Possibly but it really depends upon the amount of the curve Vs the overall weight! Just be prepared to do some further work if it has problems. It will be easy to strip down! 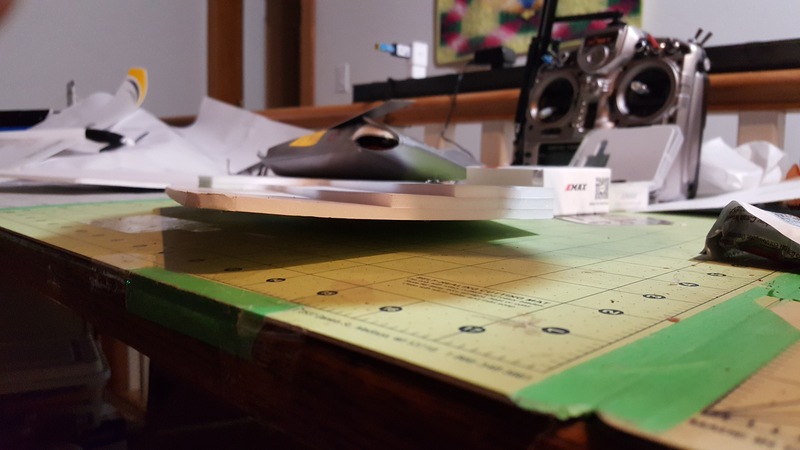 Are you dropping the servos into the top layer or top and middle layers, @Hai-Lee? There have been over 50 built and so far the servos have been mounted on top of the centre layer just behind the step, and some buried in the top section just in front of the step, (dig down 2 layers only). 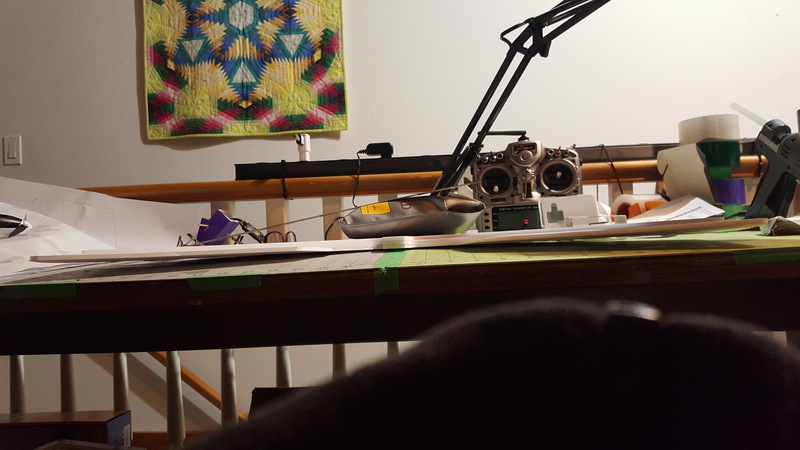 The servos normally lay on their side and so are only about 10mm in height anyway. All installations run the servo wires along the rear of the step, (a touch of hotmelt works well). Try to make the pushrod fit at right angles to the elevon hinge line. The closer the elevon control horns are to the motor the less the weight on the rear of the wing caused by the servo positions. I normally mount the control horns about 2 inches along the elevon hinge line from the motor mount end. If needed I can do a couple of close up pics of the "Bat" wing servo installations! Ha! Welcome to MY world! jross, I'm just chiming to say I'm completely fascinated by this thread. I'm with Hai-Lee, I can't wait to see it fly! I am curious, though about your fascination with the "wings." Why? What draws you to them so strongly? I've got kind of the same deal with multi-wings, because I love the way they look, the idea of actually flying and fighting in one, and the amazing way they turn and loop and flip. Why do you want to fly a wing so badly? Just curious. @buzzbomb Simply put a wing is the most basic and yet most pure form of flight. 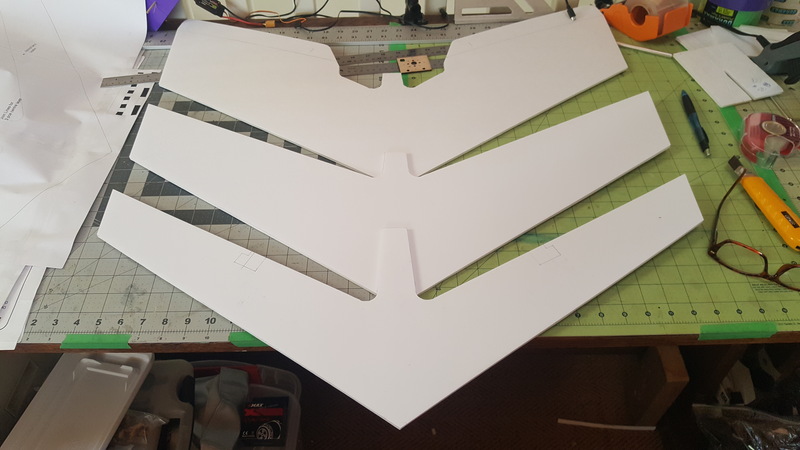 Normally they are simple to build, (no fuselage or tail to build and setup), far lower parts count, (only 2 servos required and yet still fully aerobatic), and is designed properly they can be the lightest of wing loading for their wing area. Also think if near indestructible they would actually be the ideal beginners platform, (if they had a little dihedral stability or a flight stabilizer included). I encourage everyone to build and fly at least one wing in their life and most who have built and flown one will keep one in their hangar from then onwards! Actually the most popular model I build! I should clarify. I've flown a large wing once it was put in the air by a friend. A chimera. All the smaller wings I've tried to fly on my own died pretty quickly. I also love pushers like the Explorer/Bixler/Penguin style and some of the multi motored WW2 planes. I think all of the sea planes are pretty cool too. With the wings, I guess I like a challenge and don't like being shut down. I love the way they fly. With what I learned from my trainer and explorer, I should be able to make this thing fly. I have the added incentive of potentially flying the Drak I bought. 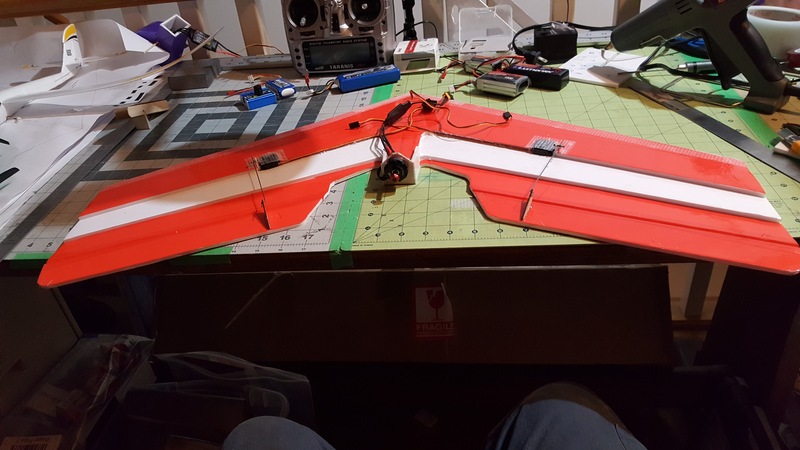 A buddy gave me a Zephyr 2 and another large wing that need some lovin' but will fly. They're all big FPV planes I own and would love to fly. So I thought I'd start small and simple and try again. I kept on building. Not sure if it was the application of tape or the glue finishing it's cure but the taco effect is dramatically reduced. Main noticeable distortion is on the lower layer at the back. The lower layer kicks up, kinda like reflex. A cm of dihedral remains on each side. I used one of the large FT firewalls and trimmed it down. Already had all the holes so made it easy. I hot glued it, added the foam buttresses and then went around the side and bottom with packing tape, much like the swappable power pods. I fit the servos tight and used double sided tape on the bottom, a dab of hot glue around the top and then duct tape to cover. I tried the motor mount used in the Explorer but it was too big. Used large FT control horns. Heavy packing tape on the bottom, regular on top and clear duct tape over leading edge with extra strip over nose area. I laced the packing tape on the bottom so it crossed at the center and continued to the leading edge of the wing. When I cut the foam on the leading edge, I cut the bottom roughly 45 degrees and the top about half that. Radio is set up for the most part. Just need to finish installing the RX, ESC and battery. I have some 900, 1500 and 2200 mah 3S batteries. Guessing the 2200 will be too heavy. I've waterproofed the ESC and would like to do the same with the RX. Need to find something similar to CorrosionX in Canada. next is to see if it flies! Been snookered by weather and work so it will be a few days. After days of rain and a solid freeze, landing anywhere on uneven concrete covered in 40 grit sandpaper was a bad idea. If it's snowing, I'll fly. If it's raining, count me out. Now it's snowing which will make for soft landings. Problem is, I have a large parking area, a deck and a 700 foot driveway that need clearing. 30 cms, over a foot, in the last 24 hours. And it's still snowing. Got me thinking about a locator beacon for planes like we use for backcountry skiing and sledding. Tempted to buy an older used one and rip out the guts to install in a plane and then use my transceiver to locate planes. Gives you distance and direction up to about 400 feet. I think the build is good, @Hai-Lee. I'm concerned about reflex for it. The bottom layer curves up and already has reflex. Guessing but I'd say there is 3-4 mm of rise from the end of the middle layer to the back of the bottom layer excluding the elevon. Do I match it or add a bit more? I guess in the soft snow, it won't matter. Got the equivalent of CorrosionX at Canadian Tire today. Will treat the RX tonight, dial it in and it's ready for work and weather to subside. I would make the elevons match the curve in the wing BUT i would also make sure I have good control deflection and add plenty of expo. 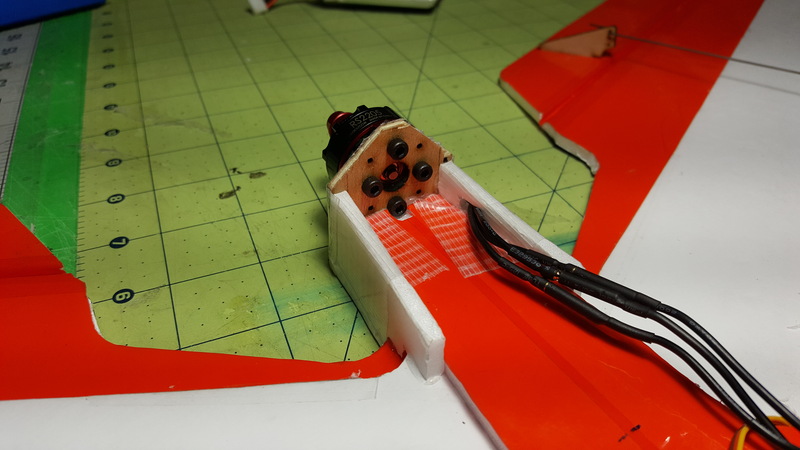 After the first flight you can adjust the elevons for the required amount of reflex and then turn down the throws and even the expo if you wish. Plenty of throw and expo will allow you to be able to stop it from nose diving or any tendency to nose up and even loop due to poor reflex adjustment. Make the first flight short and horizontal if possible to get an idea of the refelx angle required! After that help yourself and ENJOY! One more question, @Hai-Lee. You recommend "Elevon deflection: Nominal: +/- 20mm (Recommended Maximum +/- 30mm)" Is that total throw or throw in one direction? Is the minimum deflection of +/- 20mm the same as 1 cm up and 1 cm down? +/- means plus and/or minus so up 20 and down 20. I little more up than down is quite OK but not the reverse. Also 20 mm will give good quick and solid handling whereas 30mm will give crazy maneuverability assuming you have a good fast "F" pack setup or more!